Investigative reporter Luke Rosiak is being hailed as “one of the smartest, most diligent reporters in Washington” (TUCKER CARLSON) and “a bulldog” (DANA LOESCH) for uncovering “what is possibly the largest scandal and coverup in the history of the United States House of Representatives” (NEWT GINGRICH). It’s like something out of a spy novel: In the heat of the 2016 election, an unvetted Pakistani national with a proclivity for blackmail gained access to the computer files of one in five Democrats in the House of Representatives. He and his family lifted data off the House network, stole the identity of an intelligence specialist, and sent congressional electronic equipment to foreign officials. And that was only the beginning. 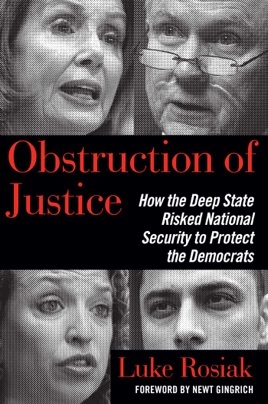 Rather than protect national security, Congress and the Justice Department schemed to cover up a politically inconvenient hack and an underlying fraud on Capitol Hill involving dozens of Democrats' offices. Evidence disappeared, witnesses were threatened, and the supposed watchdogs in the media turned a blind eye. Combining tenacious investigative reporting and high-tech investigative techniques, Luke Rosiak began ferreting out the truth, and found himself face to face with the "Deep State," observing how Nancy Pelosi's Democrats manipulated the Department of Justice, the media, and even Republican leadership to sabotage the investigation into what Newt Gingrich calls possibly the biggest congressional scandal in history. Going on what I heard this is a must read. You will not believe this could happen, not be fully investigated, and those responsible brought to justice. Please put politics aside on this as it is about national security.